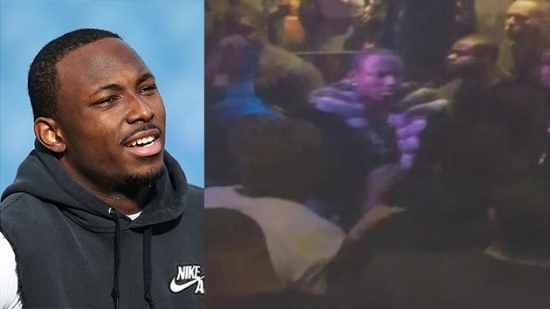 Former Philadelphia Eagles running back LeSean McCoy will not face any discipline from the NFL for his role in a nightclub brawl in Old City that involved off-duty Philadelphia police officers. It happened around 2:45 a.m. at Recess nightclub on S. 2nd Street back on February 7th. The fight was apparently over an expensive bottle of champagne in the club's VIP section. Philadelphia District Attorney Seth Williams declined to press any charges after reviewing the incident saying that there was 'insufficient evidence' to determine the primary aggressors or what wasn't justifiable as self-defense. There were several videos released and many witnesses interviewed. The Pennsylvania Attorney General's office declined to review Williams' decision. One officer suffered a broken jaw and ribs, while another received several stitches and a fractured skull. McCoy played for the Buffalo Bills last season. The Corcoran family of North Wildwood, NJ, has been reunited with an American Flag that was stolen from them on the 4th of July. The flag was given to the family after the funeral of 19-year-old Patrick Corcoran, who died along with 73 other sailors in a 1969 naval catastrophe during the Vietnam War. * The flag was flying on their neighbor's pole on July 4th last week and someone took it overnight. It was mysteriously returned on Monday afternoon. The family is glad that their family history was returned and do not plan to file charges. 6 people were injured, including 3 children in a multi-vehicle crash in Fairmount Park during rush hour this afternoon. The accident happened just before 5 p.m. on Martin Luther King Drive between Strawberry Mansion Bridge and Falls Bridge. Five vehicles were involved in the accident. A 6-year-old, 9-year-old and 14-year-old were rushed to Hahnemann University Hospital. A 33-year-old woman and 36-year-old man were also rushed to Hahnemann. A 50-year-old man was taken to Penn Presbyterian Medical Center in stable condition. No word on what caused the accident but there have been scattered downpours all day. Police are investigating.